I was delighted to read this fascinating, authoritative book – a majestic work which commends itself to the top stratum of important, and meticulously researched provincial Anglo-Jewish community histories. Jews arrived in Cornwall in the 1740s. A small number disembarked at Falmouth and one or two at Fowey, only to move on promptly to London and elsewhere. Others arrived in Cornwall, mainly from continental Europe. 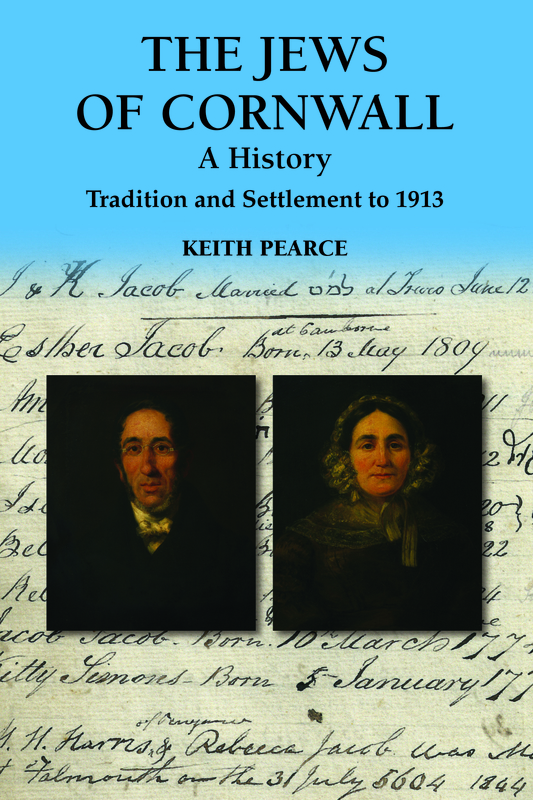 In his book, Pearce has tried to identify and research every Jew who settled in Cornwall up until 1913. He supplies their family history, places of origin (usually overseas), when and where they settled, their occupations and significant life events. He presents documentary particulars (births, marriages, deaths, newspaper reports, archival papers, minute books, obituaries, naturalisation documents), and details of where they were buried. Amongst the many families treated in detail are the de Pass and of Lemon Hart families. The detailed chapter on cemeteries is includes all legible headstone inscriptions with an English translation from the Hebrew. Further chapters provide interesting details of congregations and how they functioned. He presents biographical accounts of the Rabbis for each congregation, conscientiously dealing with all ambiguities, uncertainties and contradictions which permeate almost all eighteenth and nineteenth century congregations’ histories. Some ministers were well established; many were peripatetic, yet Pearce manages to track many of their postings across the country and beyond. Tikkunim, the congregations’ formal regulations, are detailed and give valuable insight into the mindset, anxieties and strictness of the times. Another chapter records a few post-1913 noteworthy Jewish Cornwall residents. A major strength of the book is the combination of the painstaking detail – which Pearce skilfully manages to make easy reading of the variety of topics that discussed throughout. We therefore learn about economic history, court case reports, Freemasonry, mining, railways, wrecks, etymology, Cornish language, migration, and Jewish traditions, onomastics, observances and customs. A fascinating analysis of the many traditions and legends about Cornwall’s supposed long-past associations with Jews, Judaism or the Hebrew language is presented: many are systematically disproved or discredited. Pearce is refreshingly exacting in stating the degree of certainty or pertaining to any fact, claim or supposition. It is instructive to review where Pearce’s book stands in the genre of English provincial Jewish community histories. Firstly, Pearce’s book at 624 pages is the longest history of an Anglo-Jewish provincial community. It is the third longest single-volume book on any aspect of Anglo-Jewish history ever written. Secondly, Anglo-Jewish provincial community history is a relatively recent subject. In 1938 Bertram Benas remarked that his father’s work on Liverpool and one on Birmingham (E. Lawrence Levy’s Birmingham Jewry 1870 and 1929; 96 pages; circa 1929) had been virtually the only substantial histories written about any provincial Jewish community. Since the Second World War, several more emerged; many published with in the last fifteen years. A pioneer, Rabbi Bernard Susser, set out the first major account of the Jewry in the south-west in 1993 (not disregarding Alex Jacob’s earlier research). 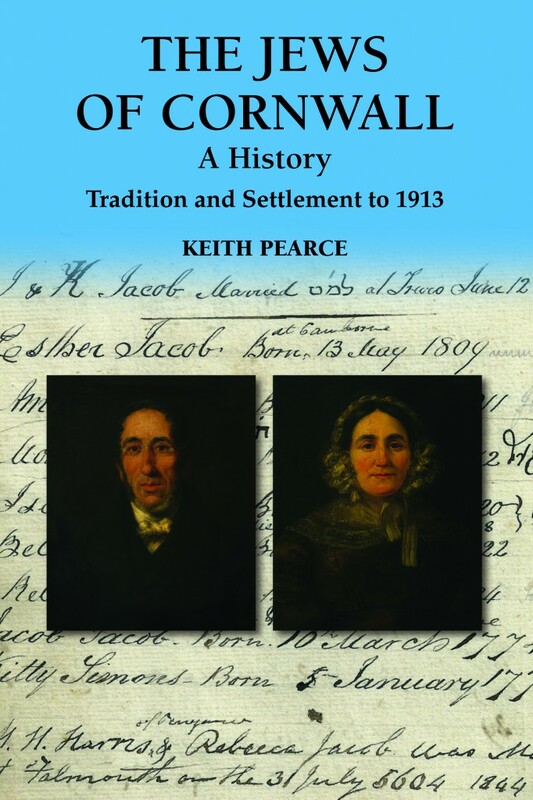 Keith Pearce and Helen Fry published their The Lost Jews of Cornwall in 2000. Half a generation later, Pearce amassed a prodigious amount of material derived from thirty years’ continuous research to produce the third book on Cornish Jews. He broadened the syllabus and introduced new research topics for inclusion. A book of this comprehensive nature is unprecedented for a provincial Jewish community. Thirdly, his book relates to the small number of communities that had been established by the mid-eighteenth century and had ceased over a century ago. Fourthly, Pearce’s book is almost unique in being a history of the Jews of an English county per se. Finally, let me recount a recent experience. I purchased a Yom Kippur machzor published in 1860. Its free endpaper bore an inscription by “Anne Jacob, Falmouth”. It mentioned that her father had died a few months ago on the “21st day of Shevat 5620,” “aged 47 yrs”. I checked Pearce’s book and established from the genealogically-based index there had been a “Moses Jacob (1812-1860)” who was president of the Falmouth congregation. Within minutes, I discovered the identity of the inscriber’s late father along with his personal history. The book displayed his family tree, one of thirty-one altogether. I found in Pearce’s book not only a photograph of him and another of his family taken but also the headstone epigraphy which fitted the machzor’s inscription details exactly. My finding complete congruence between evidence from the book and a completely independent external source (over 250 miles from Cornwall) amply attests to the usefulness, accuracy, accessibility and coherence of Pearce’s research. The book is fully furnished with source reference notes. There are sixty-four plates incorporating over 150 finely reproduced illustrations, many in colour – all contributing to a handsomely presented book. The book is important to a broad range of readers and is an integral component of Cornish history, indispensable for those researching Anglo-Jewish history. It also provides the general reader and the student of British history with an absolutely authentic, accessible and interesting account of a set of Jewish local communities, their intricacies and idiosyncrasies. Cornwall and British Jewry are indebted to Keith Pearce as an archival conservationist, cemetery custodian, and historian and author of an important, diligently researched and authoritative masterpiece. Michael A. Jolles is a leading Anglo-Jewish researcher, Michael Jolles is a member of the Council of the Jewish Historical Society of England and Fellow of the Royal Historical Society.